If your email address looks unprofessional, you are losing customers. You will be clueless, because they will not have contacted you! 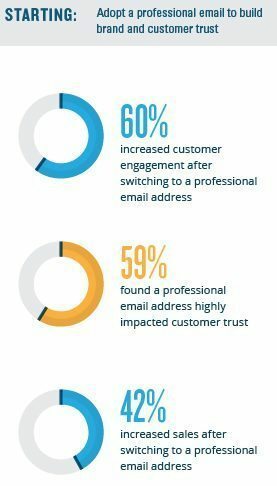 A lot of small businesses opt to keep their old, personal, generic email address e.g., [email protected], [email protected]. DON’T. Instead, you should get an email address that uses your website’s domain. But, why go through the hassle of changing your email? As the saying goes, if it ain’t broke, don’t try to fix it—right? The second one, right? It all hinges on trust. The personal email address smacks of amateurism, which will lead potential customers to start second-guessing: Is this business legitimate? Can I trust them to deliver?? Will they steal my money??? On the other hand, the address with a business domain conveys professionalism, reassuring a potential customer that this is an honest, established business they can rely on. Below you will find all the tech mumbo jumbo to back this up. If you need to see the numbers, read on. But, if you want to make this upgrade or have questions, Grover Web Design can help! Google surveyed businesses that started out life with a personal email address, then switched to an address with a business domain later on. 60% of these businesses reported an increase in customer engagement and 42% reported an increase in sales as a result. That’s a massive result for something as seemingly minor as changing the words after the “@” symbol. But that’s because, it’s not minor—the domain instills trust. 3 Reasons why you should NOT conduct business using a Generic Email Address. FREE, generic or ISP based email addresses do not look professional. FREE, generic or ISP based email addresses do not make you look like a permanent company who will be around for the longer-term. Emails from generic, Free or ISP based email addresses are the ones most often used by scammers and thieves. This means your emails will not always get through business strength email servers (such as Microsoft Exchange ) that protect businesses from SPAM. 4 more reasons you SHOULD conduct business using your own domain name email account. Adds Credibility – As the saying goes: “You never get a second chance to make a first impression“. Having your own domain name projects a professional image of you and your company, normally associated with large companies. It tends to say to others that you’re a serious business person, operating an established business, in a professional manner. Free advertising – Every time you send email from your domain, you are advertising your brand or business name and strengthening your brand amongst those who receive your message. What do you think is the best email system to use? Great question Tim… thanks for asking. The answer is definitely Google Apps. It's easier than you think to get started with Google Apps. Fill out the form below and we will get in touch with you.